Begin with your arms extended straight out in front of you, holding the band with both hands. 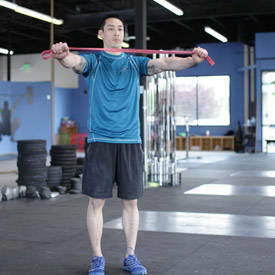 Initiate the movement by performing a reverse fly motion, moving your hands out laterally to your sides. 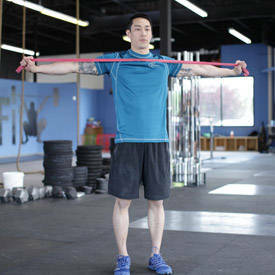 Keep your elbows extended as you perform the movement, bringing the band to your chest. Ensure that you keep your shoulders back during the exercise. Pause as you complete the movement, returning to the starting position under control.